This study evaluates the effect of Ginger solution concentrations (GSCs) on the quality of Millet-based Kunun-Zaki (MKZ). Six (6) samples of MKZ were prepared using millet, Ginger solution concentrate and sugar syrup and they were coded, 200 (KZ preserved with 0% GSC), 201 (KZ preserved with 5% GSC), 202 (KZ preserved with 10% GSC), 222 (KZ preserved with 15% GSC), 232 (KZ preserved with 20% GSC) and 242 (KZ preserved with 25% GSC). The findings of this study suggested that the pH values observed and recorded from the day 3 indicated that the samples 200, 201 and 202 were slightly acidic ranging from 3.13 to 3.40, and the level of acidity of 3.32 increased more in sample of KZ coded 200 (the control sample); while on the day 1 and day 2 stable pH values of about 4.9 to 5.0 were recorded from samples 222, 232 and 242, respectively. This study suggest that the GSC ratio of 15%, 20% and 25% controlled the pH of the MKZ effectively for about 72 hrs, while ratio of 5% and 10% showed a drop in pH within the 48 hrs of production of MKZ, while the control (0% GSC) showed a drop in pH within 24 hrs of the production of MKZ. Also, the results of the sensory analysis conducted on the samples of MKZ indicate that the sensory properties of MKZ were stable for 48-72 hrs without any adverse change. This study concludes that this standard operating procedure (SOP) established from this study can be adopted for the commercial production of MKZ. This research is aimed at evaluating the significance of spicing MKZ using a suitable ratio of Ginger concentrations solution for the purpose of monitoring its sensory attributes, pH value and the establishment of standard operating procedure (SOP) for commercial KZ production. Hence the need for the utilization of local raw materials, such as the Millet (i.e. Pennisetum typhoides) and Ginger (Zingiber Officinate), and the requirement for the adoption of a suitable ratio of Ginger solution concentration for the production of quality and safe traditional beverage known as Kunun-zaki (KZ) in Nigeria prompted this research. Several studies have established and reported that KZ is a product of lactic acid fermentation.4,8 KZ is a product of cereals and spices, such as the ginger and black pepper, and sugar; some home producers add sweet potatoes in the production of KZ to improve its taste and sweetness.4 And it is produced at cottage level by most house wives to support the income of the family, and it is commonly consumed among the people domiciling in the northern parts of Nigeria. KZ is usually sold at schools and markets.4 Also, an attempt to package and commercialize KZ has been in progress,25 and packaging of KZ can be successfully accomplished if it is properly prepared. The objective of this study is to produce safe and quality KZ prepared from the slurry of Millet, sweetened with inverted sugar syrup and spiced with suitable ratio of Ginger solution concentration. Ginger (Zingiber Officinate Roscoe) is a monocotyledon belonging to the family of zingiberaceae which are aromatic, and some of the species of the Ginger are non-aromatic.4 Ginger is obtained from the perennial plant Zingiber officinate which grows up to 2ft in height. The edible stem, used in sweet manufacturing is an underground root like scaly leaves and buds. Successful cultivation of Ginger requires frequent application of manure, a sufficiently, high rainfall and a high air temperature. Materials required for the production of Millet-based Kunun-zaki (MKZ) and Ginger concentration solution (GCS) include, Millet, Ginger (fresh), granulated sugar and potable water. The millet, ginger (fresh) and granulated sugar were purchased in Kaura-Namoda Central market, Kaura-Namoda. Other materials used were sourced from the Federal Polytechnic, Kaura-Namoda, department of Food Technology, Food Processing workshop, for the production of MKZ and GCS are weighing balance, potable water, pressure cooker, stove, muslin cloth (0.0025mm), stainless pot, bowl (plastic), stirrer and thermometer. 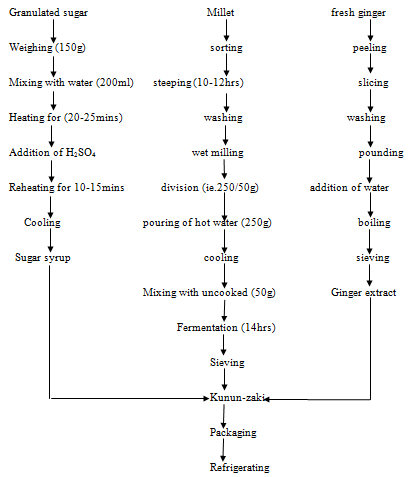 Figure 1 Process flow diagram for the production of KZ using ginger extract and sugar syrup. There are several methods employed in the production of MKZ. Methods such as the pre-fermentation, post-fermentation, and malting are always used in the preparation of MKZ.7,9 For the purpose of this study the post-fermentation method was adopted and used for this study. Ginger concentration solutions (GCS) was added into the different samples of Millet-based Kunun-zaki (MKZ) as itemized in Table 2 below. The Table 3 above is an illustration of how Ginger solution concentrates were added into Millet Kunun-zaki (MKZ) at different ratios and was subjected to pH determination for three days. 1Each value is the mean standard error (±) of triplicate determinations. 2Different letters within the same column with each test are significantly different (p<0.05). During this ranking, the panelists are not allowed to have ties, thus the method will be forces choice.31,32 The sample were ranked from most liked to least liked using the following numbers 5-1, where 5=least liked and 1=most liked, the ranking was done for every 24hrs for three days to actually detect the effect of ginger extract concentration on the sensory quality of processed KZ. This part of the study presents and discusses the results of the sensory evaluation conducted on the samples of ZD stored and observed for 3 days (Table 6‒10). Sensory evaluation results imply that MKZ organoleptic qualities including aroma, colour, taste (mouth feel) and overall acceptability remain accepted by the sensory panelist for 72 hrs especially by the samples of MKZ that have 15%, 20% and 25% Ginger concentrations in them; while the sample with 0% (control), 5% and 10% samples were less accepted by sensory judges in terms of all the attributes listed (P<0.05). Although, there are some studies that reported contrary opinions regarding the use of honey in the control and management of diabetes mellitus diseases, other several research findings favourably discuss and opined that honey with high amounts of Fructose can be used to manage and control Type 2 diabetes. Hence, the need for larger sample sized; multi-centre clinical controlled studies so that better and reliable conclusion can be drawn.14 In essence, the use of inverted sugar syrup to improve the taste of MKZ in this study can conveniently suggest that this developed MKZ can be consumed in moderation by an individual suffering Type 2 diabetes because the major component of this processed sugar product is Fructose. Based on the results in this study, the pH values of samples of Millet-based Kunu Zaki (MKZ) were stable for 2 days, but dropped in day 3 due to the breakdown of complex sugars in the KZ by the action of micro-organisms and enzymes’ activities leading to the increase in the acid level of MKZ samples within 72 hrs of MKZ production. And the results of sensory evaluation revealed that ginger extract concentrate (GEC) added into the processed Kunu zaki (KZ) enhanced the shelf-life of samples 222 (KZ preserved with 15% GEC), 232 (KZ preserved with 20% GEC) and 242 (KZ preserved with 25% GEC) for 48-72 hr. This is because these samples (222, 232 and 242) of KZ were preferred (P<0.05) by the sensory judges during day 1 and day 2, respectively. In conclusion, the pH of MKZ can be controlled for 2 to 3 days by the addition of 15%, 20% and 25% of GSC, respectively and subsequent storing at 4-5°C (P<0.05). This study indicates that this process could serve as the standard operating procedure (SOP) for the commercial production of MKZ for a willing entrepreneur. Maji AA, James O, Chigozie OE. Effect of Chemical Treatment and Pasteurization on the Shelf life of Kunun zaki (Sorghum and Maize Gruel). European Journal of Food Research and Review. 2011;1(2):61‒70. Olufunke AP, Oluremi KO. Assessment of Nutritional and Sensory Quality of Kunun Zaki: A Home‒made Traditional Nigerian Beverage. Journal of Nutrition and Food Science. 2015;5(3):1‒3. Adebayor YB, Mark FD, Oluchi AU. Pastuerisation and Chemical Preservative Effects on the Physico‒chemical, Sensory Properties and Microbial Qualities of Kunun‒Zaki. International Scholars Journals. 2016;2(4):117‒123. Mohammed SF, Balen DMA. A Review on the Safety and Quality Associated with Traditional Beverages. Food Science and Technology. 2016;17(1):203‒210. Anyanwu KB, Nsofor LM. Effect of Heat Processing on Refrigerated Shelf life of Concentrated Kunu‒zaki Beverage. Journal of Food Science and Technology. 1992;29(1):40‒41. Ijeh II, Omodamiro OD, Nwanna IJ. Antimicrobial Effect of Aqueous and Ethanolic Fractions of Two Cereals. Journal of Biotechnology. 2005;4:953–956. Efiuvwevwere BJO, Akoma O. The Microbiology of Kunun‒Zaki: A Cereal Beverage from Northern Nigeria During the Fermentation (Production) Process: World Journal of Microbiology and Biotechnology. 1995;11(5):491‒493. Nkama I, Agarry OO, Akoma O. Sensory and Nutritional Quality Characteristics of Powdered ‘Kunun‒zaki’: A Nigerian Fermented Cereal Beverage. African Journal of Food Scienc. 2010;4(6):464‒370. Awogbenga MD, Ahmadu M, Ozigis AA. The Glycemic Effect of Kunu‒zaki on Blood Glucose in non‒diabetic Subjects. Proceedings of the 23rd NIFST Annual Conference and General Meeting held in Abuja between 25th to 27th October. 1999; p. 217‒218. Adeyemi T, Umar S. Effect of Method of Manufacturing on Quality Characteristics of Kunu‒Zaki: a Millet Based Beverage. Nigerian Food Journal. 2004;12:34–40. Solange AKA, Georgette K, Gilbert F, et al. Review on African Traditional Beverages. American Journal of Research Communication. 2014;2(5):03‒153. Steinkraus KH. Lactic Acid Fermentation in the Production of Food from Vegetable, Cereal and Legumes. Antonie. Van leeuwentwek. 1983;49(3):337‒348. Ayo JA, Okaka JC. Interaction effect of Cadaba Farinose and Crude Extract and pH levels on Some Physiochemical Properties of Kunu‒zaki. Proceedings of NIFST Annual General Meeting held in Abeokuta between 23rd‒26th November. 1998. p. 31‒33. Bobis O, Dezmirean DS, Moise AR. Honey and Diabetes: The Importance of Natural Simple Sugars in diet for Preventing and Treating Different Types of Diabetes. Hindawi Oxidative Medicine and Cellular Longevit. 2018;10:1‒12. Oguntoyinbo FO, Tourloumousis P, Gasson MJ, et al. Analysis of Bacterial Communities of Traditional fermented West African Cereal foods Using Culture Independent Methods. International Journal of Food Microbiology. 2011;145(1):205‒210. Fapohunda SO, Adewale A. Microbial Load and Keeping Quality of Kunu under Various Preservative Regimes. Journal of Nutrition and Food Sciences. 2012;2(141):1‒4. Adegoke GO, Odeyemi AO, Hussien O, et al. Control of Ochratoxin A (OTA) in Kunuzaki (a Non‒alcoholic Beverage) using DaniellinTM (Short Communication). African Journal of Agriculture. 2007;2(4):200‒202. Roberts D Hobb’s. Food Poisoning and Food Hygiene. 7th ed. In: Mclaunchlin J, Little C editors. UK: Edward Arnold Ltd; 2007. p. 7‒13. Lither D, Larsson A, Dave G. Environmental and Health Hazards Ranking and Assessment of Plastic Polymers Based on Chemical Composition. Journal of Science of the Total Environment. 2011;409(18):3309‒3324. Osuntogun B, Aboaba OO. Microbiological and Physico‒chemical Evaluation of Some Non‒alcoholic Beverages. Nutrition Journal of Pakistan. 2004;3(3):188‒192. Creppy EE. Update of survey, regulation and toxic effects of mycotoxins in Europe. Toxic Let. 2002;127(1‒3):19‒28. Douglas LP, Carlos EA, Sonia EGP, et al. Microbial Toxins in Foods, Algal, Fungal and Bacterial. In: William H, Carl KW, editors. Food Toxicology. UK: CRC Press. 2001. 222 p.
Adegoke GO, Letuma M. Strategies for the Prevention and Reduction of Mycotoxins in Developing Countries. In: Makun HA, editor. Mycotoxins and Food Safety in Developing Countries. Croacia: InTech; 2013. Federal Institute of Industrial Research, Oshodi. Production of Soft Drinks from Nigeria Ginger. Technical Information Bulletin for Industries. 1998;4‒6:1‒4. Federal Institute of Industrial Research, Oshodi (n.d.): Brochure, FIIRO, Federal Ministry of Science and Technology. 1998. 6 p.
Less R, Jackson EB. Development of Ginger Extract Concentrate. Leonard Hills; 1989. p. 21‒37. Irvine FR. West Africa Crops. London: Oxford University Press; 1995. p. 40‒42. Muhammad SF. Production of Sugar Syrup. A Practical Guide for Beverage (Soft drinks) prepared for Centre for Research and Entrepreneurship Development (CRED), Federal Polytechnic Kaura‒Namoda. 2012. p. 29‒30. Ihekoronye AI, Ngoddy PO. Integrated Food Science and Technology. London: Macmillan Publishing Ltd; 1985. p. 306‒307. Lawless HT, Heymann H. Sensory Evaluation of Food: Principles and Practices. 2nd ed. New York: Springer Science; 2010. p. 303‒320. Iwe MO. Handbook of Sensory Methods and Analysis. Nigeria: Rojoint Communication Services Ltd; 2002. p. 71‒78. Iwe MO. Current Trends in Sensory Evaluation of Foods. 1st ed. Enugu, Nigeria. Rojoint Communication Services Ltd; 2007. p. 136‒139. William M. The Importance of Food pH in Commercial Canning Operations. 1992. Obulunde FO, Ogunkoya MO, Oni VA. Mineral Composition, Shelf Life and Sensory Attributes of Fortified Kunuzaki Beverage. Acta Sci Pol Technol Aliment. 2006;5(1):155‒162. Agarry OO, Nkama I, Akoma O. Production of Kunun‒zaki (A Fermented Cereal Beverage) Using Starter Culture. International Research Journal of Microbiology. 2010;1(2):18‒25. Edward KC, Ohaegbu CG. The Effect of Ginger and Garlic on the Microbial Load and Shelf Life of Kunun‒Zaki. Journal of Applied Pharmaceutical science. 2012;2(5):150‒153. Nwachukwu E, Achi OK, Ijeoma IO. Lactic Acid Bacteria in Fermentation of Cereals for the Production of Indigenous Nigerian Foods. African Journal of Food Science and Technology. 2010;1(2):021‒026. Innocent OO, Mariam YO, Blessed K, et al. Microbial Evaluation and Proximate Composition of Kunu zaki, an Indigenous Fermented Food Drink Consumed Predominantly in Northern Nigeria. Internet Journal of Food Safety. 2011;13:93‒97. Kardrivelu A, Gurtu S. Potential Benefits of Honey in Type 2 Diabetes Mellitus: A Review. International Journal of Collaborative Research and Internal Medicine and Public Health. 2013;5(4):199‒216. Erejuwa OO, Nwobodo NN, Akpan JL, et al. Nigerian Honey Amileorates Hyperglycemia and Dyslipidemia in Alloxan‒induced Diabetes Rats. Nutrients. 2016;8(3):95. Enginyurt O, Cakir L, Karatas A, et al. The Role of Pure Honey in the Treatment of Diabetes Mellitus. Biomedical Research. 2017;28(7):3305‒3312. Romero‒Ortiz AA, Martinez‒Carrillo BE, Rillo AG, et al. Honey and Type 2 Diabetes Mellitus: Reconstruction of Problematic Field Using the Lekatosian Method. Journal of Pharmacy and Biomedical Sciences. 2017;12(6):1‒14. Dean RB, Dixon WJ. Simplified Statistics for Small Numbers of Observations. Analytical Chemistry. 1951;23(4):636‒638. Smith JS. Evaluation of Analytical Data. In: Nielsen SZ editor. Introduction to the Chemical Analysis of Foods. India: CBS Publishers & Distributors; 2002. 51 p.
© 2018 Mohammed. This is an open access article distributed under the terms of the Creative Commons Attribution License , which permits unrestricted use, distribution, and build upon your work non-commercially.